Snow machines are being used to get ready for Winterlude a month from now and crews are beginning work to prepare for the opening of the Rideau Canal Skateway later this season. Jacques-Cartier Park in Gatineau, Que., is one of the main sites for Winterlude, which begins on Jan. 30 and runs until Feb. 16. 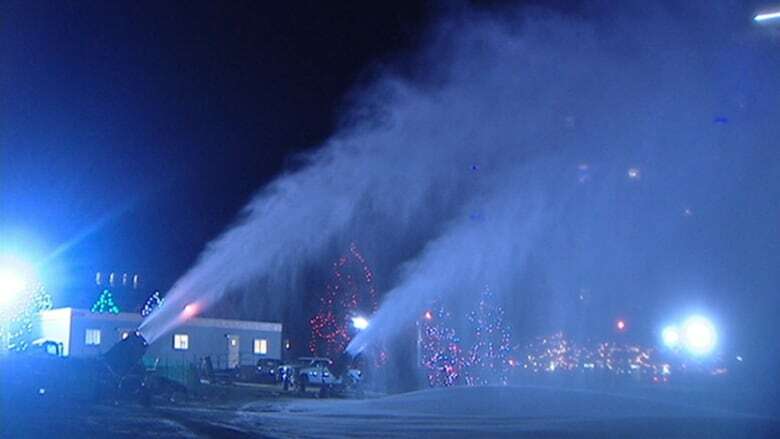 But a green Christmas has forced the City of Gatineau to use snow machines to prepare for the 37th annual winter festival, which is put on by Canadian Heritage. The snow machines began operating on Monday morning, the department said. Workers are also beginning preparatory work for the opening of the Rideau Canal Skateway. An opening date has not yet been set, but the ice surface typically opens in January and closes in late February or early March. People are being asked to stay off the ice, which is still "dangerously thin," said the National Capital Commission in a media release issued Tuesday. "Please note that the presence of work crews on the skateway must not be construed as a sign that the ice surface is stable," the NCC said. "The Rideau Canal Skateway team is made up of professionals who know how to manage the risks of their work." The ice thickness must measure at least 30 centimetres to handle people and sustained cold weather is required to achieve thickness, the NCC said. The NCC compiled the following statistics about skating season lengths. Average length of skating season over the past five years: 51 days. Longest skating season: 1971–1972, lasting 90 days. Shortest skating season: 2001–2002, lasting 35 days (26 skating days). Longest period of consecutive skating days: 46 days, from Jan. 14 to Feb. 28, 2004. Earliest opening: Dec. 18, in 1972 and 1981. Latest opening: Feb. 2, 2002. Earliest closing: Feb. 13, 1984. Latest closing: March 25, 1972.